In today’s competitive business environment, the strongest companies are those that recognize the value of maintaining accurate and current contact data and have learned to leverage that data effectively and efficiently. They understand that data can be captured incorrectly, customers move, or Postal Codes change, and look for solutions to ensure that the quality of their postal address data is maintained. These companies understand the cost of acquiring new customers and subsequently how important it is to maintain and keep their customer data current. They realize that marketing campaigns and other customer messages can be negatively impacted by poor contact data. Mismanaged resources, lost opportunities, and brand reputation are other casualties of poor data. 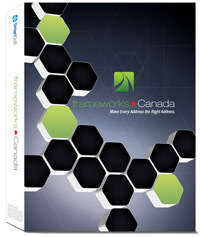 If you appreciate the power of accurate data, you’ll appreciate the power of frameworks Canada. PLUS, ask us about our Switch 'n' Save program and find out how you can save money on your Canadian mailing software by making a simple transition to frameworks Canada. Request more info today! How accurate is your customer address data? Probably less than you think. A recent Canada Post survey* showed that on average, over 11% of a typical mailing list was undeliverable due to inaccuracies in the address data. Best practices suggest that any company spending significant time and resources acquiring and servicing their customers should implement a data quality program to ensure that their valuable customer data is accurate, both at point of entry (eg websites, CRM systems, call centers) and on an ongoing basis eg monthly, or immediately prior to each mailing. The costs of not doing so can soon add up. According to Canada Post, over 140 million mailpieces every year do not reach their intended recipients due to inaccurate or incomplete addresses, costing Canadian businesses tens of billions of dollars in wasted resources, lost opportunities and more. 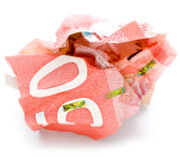 Wasted Resources –The website directmarketingonline.ca estimates an average cost of $1 per mailpiece on production alone – this includes printing, material and labor costs of a typical mailing. Mailing/Fulfillment Costs - Deliveries may be late or returned, meaning additional handling time, and possible repackaging and more postage costs. Many carriers charge Address Correction Penalties too. Lost Opportunities – If customers don’t receive your message, they cannot respond to your offer. Damaged Reputation – Your brand can be damaged by poorly targeted or irrelevant mail, incorrectly addressed mail, or multiple pieces sent to the same person? Lost or late deliveries can hurt your reputation, as well as put pressure on your support teams. Billing/Finance – Undelivered bills mean payments arrive late or not at all, impacting your cash flow. Environmental Impact – It is also important to consider the impact of wasted materials and resources spent distributing undeliverable mail. So take control of your customer database and maximize the value of your customer address data - request your FREE demo today! PLUS! 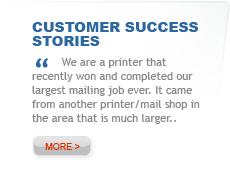 Maximize your postal savings with our SERP Recognized Presortation mailing software, frameworks Canada Mailers Edition.